A little while back, Derik Badman sent me a decent sized pile of comics. Among them was Doug Fraser's Mort Grim. The story is a fairly simple one. A sedan, trying to pass a slow-moving truck, gets into a nasty accident with a semi coming the other way. As the cops pull up, a leather-clad skeleton on a motorcycle races through, only to vanish moments later. In a small cafe, a waitress pours a final cup of coffee for a customer, who leaves to harvest his crops despite the season being well over. As he leaves, repeating "I'm not done", a car speeds by with the skeleton not far behind. A halo'd dog grabs hold of the skeleton's forearm and there's a violent crash. Seeing this, the waitress dives into the wreck. She reassembles the skeleton, pulling the bones from the dog's mouth, and informs him that the customer she had earlier is just up the road. The skeleton catches up with him, tucks his soul (still claiming "I'm not done") into his saddle bags and drives off. 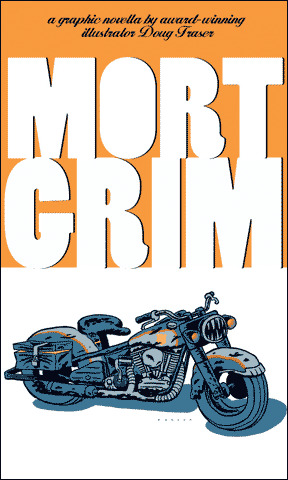 Obviously, it's an updated take on the Grim Reaper, though the motorcycle and skeleton theme can't help but also be compared to Marvel's Ghost Rider. There's a noted difference in tone, however. Ghost Rider was clearly more the spirit of vengeance, trying to punish those who committed crimes, whereas Mort here seems more existential about his role. "There is no justice. There just is." People have to die, and he just collects them when their time comes. What's more striking about the book is Fraser's art. He uses very bold linework, which is accentuated by a very limited color palette. Much like his commercial art, he's able to focus the viewer's attention on precisely the right details, and his storytelling is surprisingly (to me) smooth. There's not a lot of story here for the $5.00 price tag, but it's very nice to look at (including the varnish on the cover that you can't see in any scans) and study. It remains available from AdHouse Books.